Ask siri to tell your name on your iPhone or iPad you can do that by Saying “What’s my name?”. Now siri should ask you to tell Siri, how to pronounce your name, tell siri the right way of pronunciation. 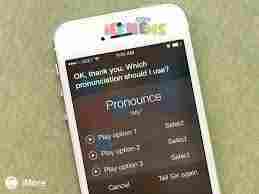 Siri will ask again you to if Siri is pronouncing your name correctly, say, it’s correct or yes. Now Siri presents you with three options for the correct pronunciation. Listen to them and tap Select next to the correct one.